You may have noticed this dividend income and net worth report is coming out a month late. Sadly, my family had a really rough February and I was extremlly busy (mostly at the hospital) for about 3 weeks. I’ll go into more detail in my February report, but i’ll cut to the chase. Everything was really awful for awhile, but we are much better now! I’ll keep this short. Getting paid real cash for zero effort and time is the best! This month I received $499.95 in dividend income! On average, I was paid $26.31 from 19 different companies (really, 18 companies and 1 preferred shares funds)!! 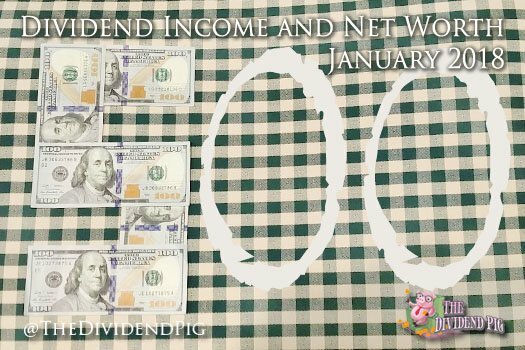 This month’s dividend income is a tremendous 236.19% increase over January 2107. This is clearly some MAMOTH sized growth from last January!! I managed to stay in the club again this month! I wonder how much longer till I get kicked out again? You might notice cash was up a small amount this month. This came from rental property #1 being sold! This money will be used to pay off our primary mortgage. However, I haven’t paid it off for a couple of reasons. I’ve been busy and more importantly, I don’t know how much I’m going to need to pay in capital gains yet. 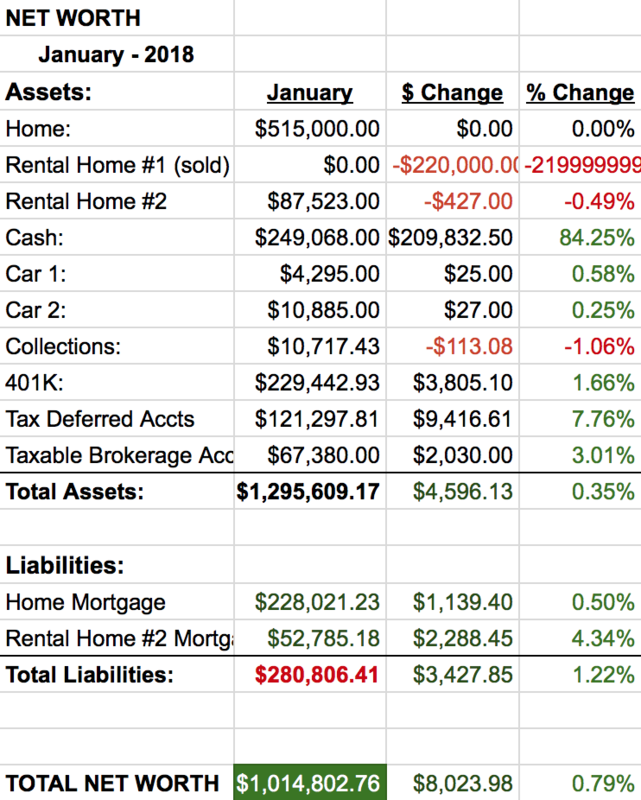 I’ll work through taxes the end of this month and will hopefully have a zero balance on my primary mortgage in the March report. Now that the rental property #1 is sold, I have some extra cash. But as I mentioned above, i’m not quite sure how much extra cash I’ll have left after I pay taxes and eliminate my primary mortgage. But let’s talk some rough real estate numbers. We sold rental property #1 for about 30k over my estimated value. This was because we invested roughly 10k fixing the place up (new kitchen appliances, painting, fancy countertops) and properties in the area were selling like crazy. We had to pay about 13k in commissions which dwindles the take home significantly. Ugh. Anyway, that’s why you see only an increase of 209k. I’ve deducted what I estimate my taxes will total and put that into a separate account. I’ll have the true final value once I get those taxes paid! It was a fantastic start to the month with regards to selling rental property #1 and the huge YOY dividend increase. While I won’t ever have a 236% dividend increase again, I should continue to show some pretty respectable increase over this next year! So, I have been following your blog for a while now and have began investing myself. I am currently a college student, how much would you suggest each paycheck to invest. I try to invest $100 each paycheck and pay a few shares of Reality Income and Vanguard. Do you think since I’m at such a younger age I shouldn’t be doing the dividend approach or just personal preference. Hi Jacob. First, great job being so proactive at a young age! That will be extremely beneficial to you throughout your career and investing life! To address your question, I would invest as much as of my paycheck as possible into dividend paying stocks. Realty Income (symbol:O) as an individual stock is good choice… and all the Vanguard offerings are solid. Focusing your investing on companies and ETFs/funds that funnel cash back to you is a great idea (in my opinion). Since you have lots of time on your hands, make sure you checkout some of the bigger dividend growth stocks as well. Companies like Disney (symbol: DIS), Visa (symbol: V), Nike (symbol: NKE) will/should continue to grow their dividend significantly each year. There are many investing strategies that will work. The trick is to find a proven strategy that you are comfortable with, and stay the course. I personally think you are on the right track. Keep up the great work! This is really terrific performance. That year on year increase is amazing. Nice return from Disney as well. $500 bucks a month is real money. I own Pepsi, Disney, Cisco, and GE, and I’ve enjoyed their dividends over the last few years. I have rentals as well, and generally they have been good investments. But the costs to buy or sell are very high, and I feel your pain about that sales commission. Sorry to hear that the month was rough otherwise. I’m looking forward to see how your investments perform for the balance of the year. Hi FIREman. Thank you for the kind words. Its a long road we travel, rolling with the occasional bump in the road (health or financial) I guess is just part of the trip. By the way, welcome to the blogging world! I look forward to following your journey. Thank you for dropping in and saying hi! Just curious with a rental do you typically handle the work and foreman duties or do you have a manager and have them handle that. I was thinking mostly it’s just collecting and making sure the house is in good shape assuming you have great tenants, also I was curious if you think it’s a good idea to give a 2-3% discount if I have them pay a couple months in advance I know it depends on the person leasor, just curious. Rental property #1 was a property I managed myself. Rental #2 has a manager. I prefer to have a manager. It costs 10% of the rent every month, but I worry about absolutely nothing. Its great. As for the discount, I guess it depends on how bad you need the money. If you’re short on cash, then you can certainly offer… however, I doubt they would accept – even for a 2 – 3% discount. Thanks for dropping in!